The next best thing to saving time in a bottle is to take a photo. Photos usually bring back sweet memories. With the exception of the first, which takes one back to June 30, 2011, all my photos are recent additions. I really enjoy re-tweaking my photos in one of the many photo edit programs. Eventually they'll become mud, I suppose. I added two frames in PhotoScape: Cali 7 and Note 3. A 'Note card Peep' checking in...and linking up! I love the frames of your photos...very pretty effect! And jars are so perfect for a flower grouping. I imagine the blueberry honey must be out of this world! I always liked sourwood honey and clover honey. Thanks for the fun party! Sweet honey hugs! All are beautiful,Vee, I especially like the idea of johnny jump-ups in the perfume bottle. Thanks for hosting! We were both thinking music this month! Love your pretty jars with flowers. Perfect for note cards. Flowers in a bottle. Simple beauty. Love them all. As usual, your photos are charming, Vee. How I love these simple jars and bottles holding sweet blooms! Thanks for hosting. I adore your pretty bottles & blooms! I'll be here tomorrow linking up with my note cards. See you then! As one of your NC peeps, I love the fact that I can do colour pallets now, thank you. 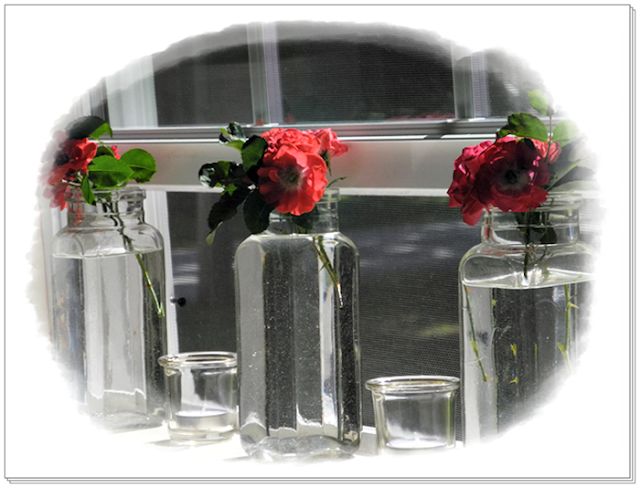 Bottles are nice to put collected flowers in and I really like the roses on the window sill. I thought you might have used it for "water" in our last personal photo challenge. Beautiful. I love those curly Spider Lilies best. Thanks for hosting! I will link up in the morning. Your photos are charming! Little flower nosegays in glass bottles are so endearing. I haven't put out little bottle vases like that in ages and ages. I don't even know what happened to the ones I had! They were either sold in the garage sales before our downsizing move, or else they are packed away in a couple of boxes that still remain in the attic. Miz Vee, now you've flung a craving on me! Very pretty note cards Vee. I would add them to my collection to send to friends - I always love the smiling faces of johnny jump ups - they lift my spirits! I'm loving your latest header too - looking through your kitchen window! I get my new laptop tomorrow - YIPPEE!!! so I might be able to join you too! I always look forward to Note Card party day! Fantastic, Shane! A gal needs her computer!! I love all the flowers in your little bottles, Vee. They make lovely note cards. I will get back to blogging one of these days and hope to join you next month. Love your flowers in the bottles! Hi Vee, Catching up on your posts, and I do love your bottle theme in your note cards. I'm also impressed at how clear your vintage medicine bottles are. Any that I find have a sort of fog on them unable to be scrubbed away! Love your previous post, and so sorry about your blogging friend. I have had several blogging "friends" sort of disappear not to be heard from again. I always wonder ..
Hi Vee.....looked through the beautiful cards so far. Probably won't join in this time....but hopeful for next! I love the bottles and the flowers - and the way you made them into ovals. Haven't seen or heard of a Johnny Jump Up for ages. Loved them when I was a little girl. This has been a great summer for flowers. You know I like little bottles, especially blue ones. So glad to be one of the regular "peeps." Thanks for hosting. WOW- those are absolutely gorgeous, Vee! Thanks for hosting one of my all-time favvie fav pinky parties. I love all of your sweet bottle and jar filled arrangements Vee! I just linked up. Better late than never! 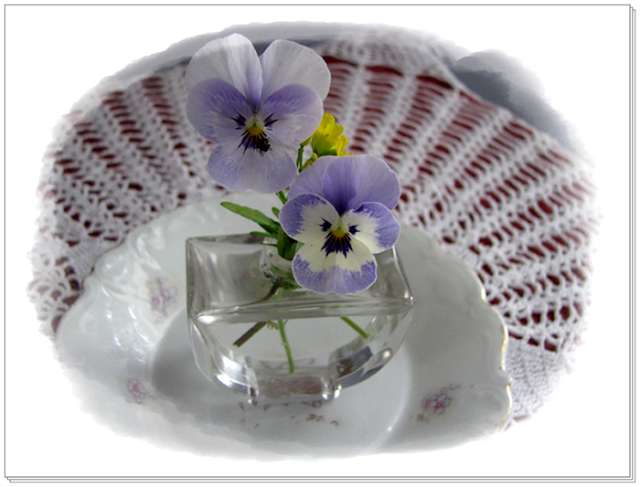 Vee, I adore the simplicity of flowers in a little glass bottle/vase! It's one of favorite "little" treasures. Yours definitely bring a smile to my face this evening. Thanks for hosting the very best party! I love your flowers in the antique jars. I use jars as vases all the time! I hope you don't get tired of my Scotland photos! That is what I used for my cards this month. Beautiful jars and flowers for your note cards Vee! One day I'm going to try to join this party!!! Such a creative idea, Vee. I like your added photoscape. What lovely flowers and vases! I especially love the one with the Maine blueberry honey jar. This is my first time at your party -- thank you for hosting. What a fun idea! It's late now, but tomorrow I'll be back to visit other linkers and see what they've chosen to share. I love what you did to your pics -- I have ZERO skills in things like that! I finally made it to the party...something I've been wanting to do for a long time. Thank you for hosting! What pretty little vases of flowers. 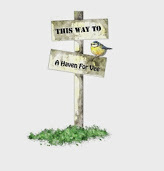 I know you enjoy have sweet little bouquets around your home. I'm so bummed that I forgot Notecard day. With school and first week of sports starting this week I totally let it slip my mind! Anyway, I loved yours this month. My favorite of all is the one in the blueberry honey jar. That's just perfect! I can see that tucked into a basket full of Maine goodies. I laughed about them turning to mud. Believe it or not, I just discovered pic monkey about a month ago. I tried to edit one of mine so it would be brighter (The one with the flaming moss.) I kept making it worse, I think. I still wanted to include it because I like it. Thanks for this wonderful party idea. I love it! What happy photos in this new collection of note cards! They're charming and dainty and so summery! It's still Wednesday so I'm linking up! Thanks for hosting, Vee! You are so creative and these are so beautiful! Those would be beautiful Note Cards. you are SO creative! 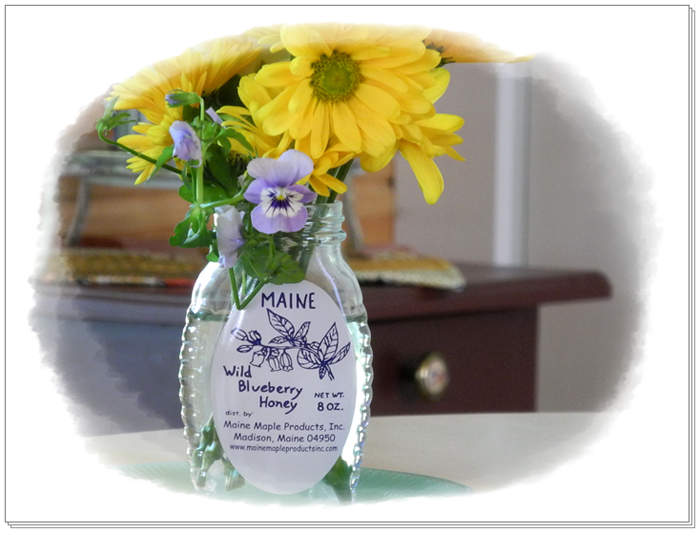 i loved the maine blueberry honey jar. wouldn't pooh have loved that? I FINALLY had a chance to join in again, Vee! So happy! Hi Vee, I FINALLY joined your notecard party! I have Pat @ Mille Fiori Favoriti to thank!!! If it wasn't for her I wouldn't have remembered!!! I took some photos in Maine this week and put them in collages and I think they would make lovely notecards! Oh wow, I love, love, love, your bottles. Blueberry honey, how is that? It sounds yummy! Time in a bottle...I do appreciate that theme ...it's perfect for the last days of summer. Thank you again for hosting and inspiring all of us. 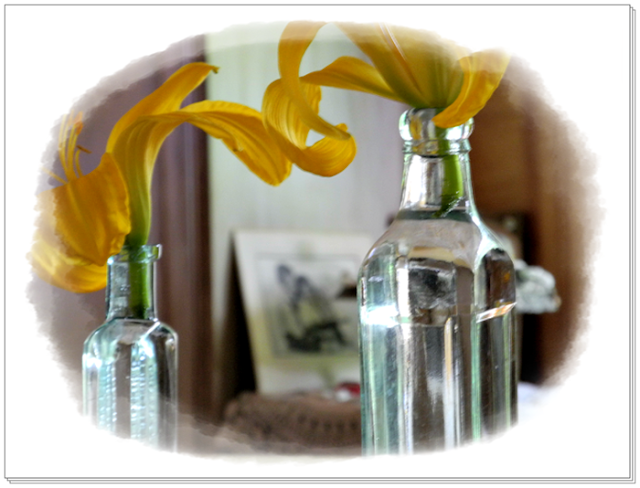 I love using bottles for flowers - it makes them go further and so delicate. Your photos are beautiful! Love all your pretty bottles of flowers. I remember Jim Croce.....Love that song. Found you through Lavender Dreams. Love the bottles...and the notecard pic's too! That was kind of you to tell me yesterday's post 'would do'. but I was very keen to try out my new laptop!!! It took me ages to find my way around my blog photos as I now have Windows 8 and it's quite different. Never mind I'll get used to it soon I guess! There's such a lovely group of cards from everyone this month Vee. Thanks for inviting us all to the party. Its a terrific way to meet new people. Your pics are lovely! So glad to have found you. I love the note card share, and would like to start joining in the fun! Each photo is captivating, Vee. Love each one. Hugs! Thank you for commenting! If you ask a question, I will answer it here in case anyone else was wondering. 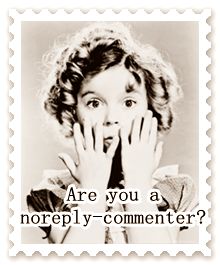 Reply boxes are provided so that you may feel free to interject a thought on any comment. I do love good conversation! After blogging for ten+ years, I've already told way more than I know. This blog remains ad, award, and word verification free; however, as a Blogger blog, this site collects cookies.